Warring sides in Ukraine on Saturday announced the start of smaller weapons withdrawal from a buffer zone as the West admitted that securing long-lasting peace would take longer than expected. After key talks with Russian President Vladimir Putin in Paris on Friday, French President Francois Hollande said the implementation of a peace plan would be extended into next year, contrary to an earlier agreement. Ukrainian President Petro Poroshenko had voiced cautious optimism overnight, telling reporters, "there is a truce", but warning that "as long as there is occupied territory the war is not over." Referring to the smaller weapons pullback, Ukrainian military spokesman Andriy Lysenko said: "This work has started this morning." The delay in implementing the so-called Minsk peace process led many analysts to see Putin scoring a tactical victory by launching air strikes in Syria and shifting Western attention away from the conflict in the ex-Soviet country. "This would take more time than expected," Hollande said, referring to the peace deal. "I think we achieved what we could," added German Chancellor Angela Merkel. 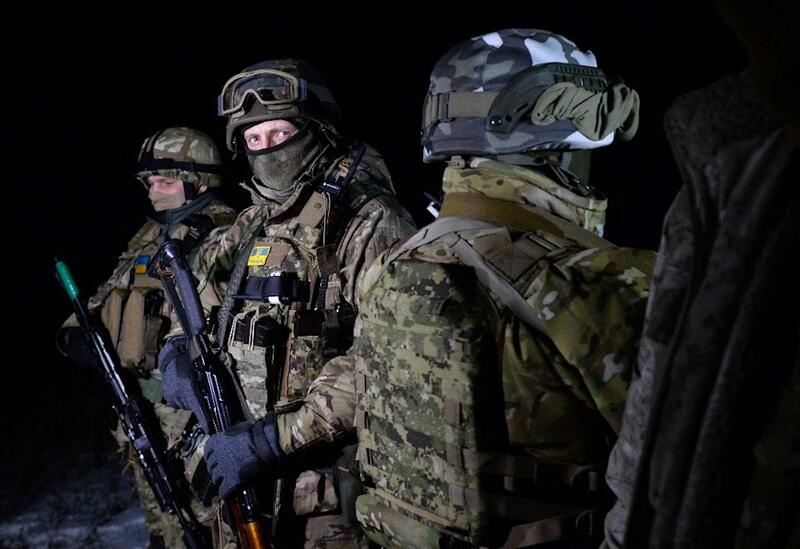 The peace plan, whose implementation has apparently now been delayed, had foreseen Ukraine re-gaining control of its borders by the end of the year. Both government forces and rebels from the self-proclaimed Lugansk People's Republic said Saturday that the withdrawal of tanks and smaller weapons from a buffer zone had begun. But rebels from the neighbouring Donetsk People's Republic said they would follow suit after October 18 if the ceasefire holds. The Organisation for Security and Cooperation in Europe declined immediate comment. 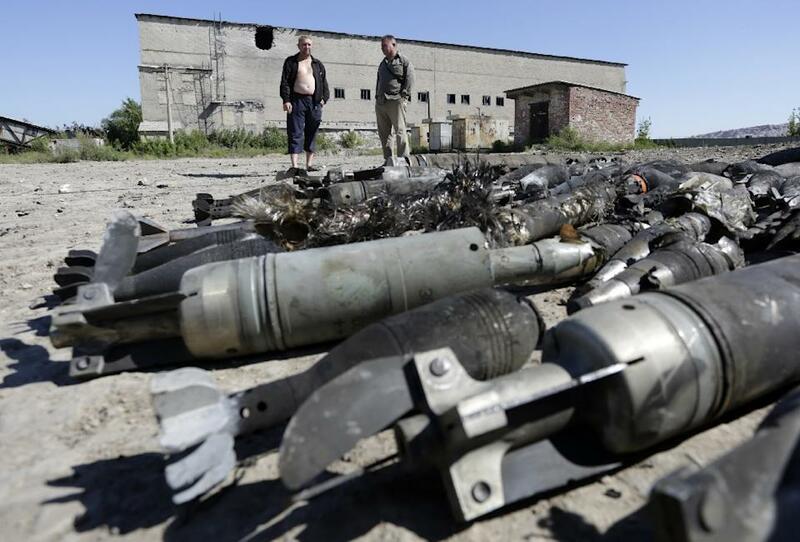 "This work has started this morning," said Ukrainian military spokesman Andriy Lysenko. "We expect the same from the militants who rushed to say that some tank column had already begun moving," said Lysenko. Moscow-backed rebels and government forces had this week agreed to withdraw tanks as well as light weapons from a buffer zone beginning Saturday to shore up the brittle ceasefire. The pullback builds on a Western-backed peace deal agreed in the Belarussian capital Minsk in February. Rebels from Lugansk announced earlier Saturday that they had already started pulling back their tanks "in accordance with the Minsk deal," said the official news agency of the rebel region. The deal will take more than 40 days to implement and see each side's mortar shells and rockets with a calibre of less than 100 millimetres moved 15 kilometres (nine miles) away from the so-called line of contact. The leaders of Russia, France, Germany and Ukraine met in Paris on Friday in the latest push to end a conflict that has claimed more than 8,000 lives since April 2014. Putin did not address the media after the Paris talks, while Poroshenko voiced cautious optimism but said the war was not over. "The war will be over when the last patch of Ukrainian land is liberated," he said after more than four hours of talks. Fighting has all but stopped in recent days but even if small weapons are withdrawn other sticking points remain, not least the rival elections planned by Kiev and the rebel regions. After the Paris talks Hollande and Merkel said the leaders had agreed that rebel polls planned on October 18 and November 1 could not go ahead. 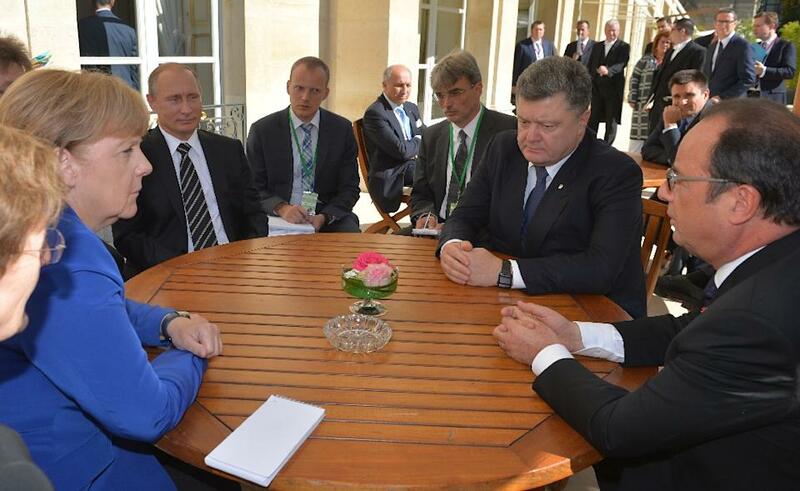 "We don't want elections to take place in eastern Ukraine that do not respect the Minsk deal," Hollande said. Rebels and Moscow did not immediately comment on the announcement, however. The rebels, who seek greater autonomy within a united Ukraine, want to hold local elections on their own terms, barring all pro-Kiev candidates and holding the polls on separate days to those planned in the rest of Ukraine. Ukraine and the West accuse Russia of supporting the rebels with troops and weapons, a claim Moscow denies. Putin has over the past days shifted Western attention away from the conflict by launching air strikes in Syria as Moscow seeks to emerge from months of isolation and ease Western sanctions. Andreas Umland, a research fellow at the Institute for Euro-Atlantic Cooperation in Kiev, detected a "change in attitude" of the German and French leaders. "Given the Kremlin's unsympathetic attitude to the Ukrainian state and its European ambitions, it would mean that Ukraine would remain fundamentally unstable," he said. Another Kiev-based analyst, Vasyl Filipchuk, said the talks showed Russia would be allowed to promote its own "scenario" in Ukraine.